The sun has slipped half-way through the horizon, with an evening which is embodying a lull before the storm in the streets of Thimphu. Thimphu is the capital city of the Kingdom of Bhutan, where I am travelling solo for leisure. I am an Indian girl, being hosted by a beautiful soul called Sania, from Pakistan. Another girl from India, Kavya, is my fellow-guest and has become my co-traveller for Thimphu. India is one of the few nations that the Kingdom of Bhutan lets unaccompanied access to, because of which I am able to experience the life of a local person.The nightlife in Thimphu is one of the most well-kept secrets of the travel industry. As the sky amalgamates orangish-yellow with blue, we walk downtown from the quite, hilly, residential area Sania lives in. She warns us that it is a bit too early to hit the Karaoke bars in the city. Instead, we decide to go to a place with great music and good food called Ama Restaurant. The walk takes us through some of the landmarks of the city. The main-town has hustle-bustle of a crowd with mixed intention; some are headed home, others are looking for watering-holes, while many have stepped out from work just now. Once in a while, we pass by the oily fumes of food being fried, which I assume are the snacks for people strolling the streets. Twenty minutes later, we step into a place which is dark and dingy, located in the narrow alleys of the main town. Inside, it is a place set in a time period everyone else seems to have moved on from, citing ‘development’ and ‘progress’. In spite of the loud music, three of us manage to weave some conversation about Bhutanese lifestyle vis-à-vis how it is done ‘back home’ in Pakistan and India. From what we understand from the exchange, Thimphu is an ‘elder offspring’ by the weekdays and ‘the younger one’ by the weekends. Responsible by the weekdays, and living a life of careless abandon by the weekends. A while later, a waiter places a menu, a small writing-pad, and a pen on the table. I am not used to the last two. I look at Sania in askance. “You write your order so that there is no miscommunication”, she explains. Wow! Half an hour into the restaurant and we feel the floor beneath us pulsate, so do the tables and walls. The karaoke bar next door has started its performances for the evening. We hurry through our dinner and decide to hop to the place next door. As we wait for our cheque, Sania bumps into an old work associate. They discuss what is happening in the town that evening, and who is partying where. All the while, carefully skirting any work-talk that could have come up. We settle our payables and step out to go deeper into the alley, in the direction where the vibrations are emancipating from. Right outside the pub was a long queue, which was growing longer by the minute. This pub looks like to be bursting at its seams. It gives an impression of being a place akin to a black hole; no one was stepping out from the tightly packed space, yet there was just enough room for a couple of more people all the time. After waiting for some time, we give it another thought and decide to go to Mojo Park instead. 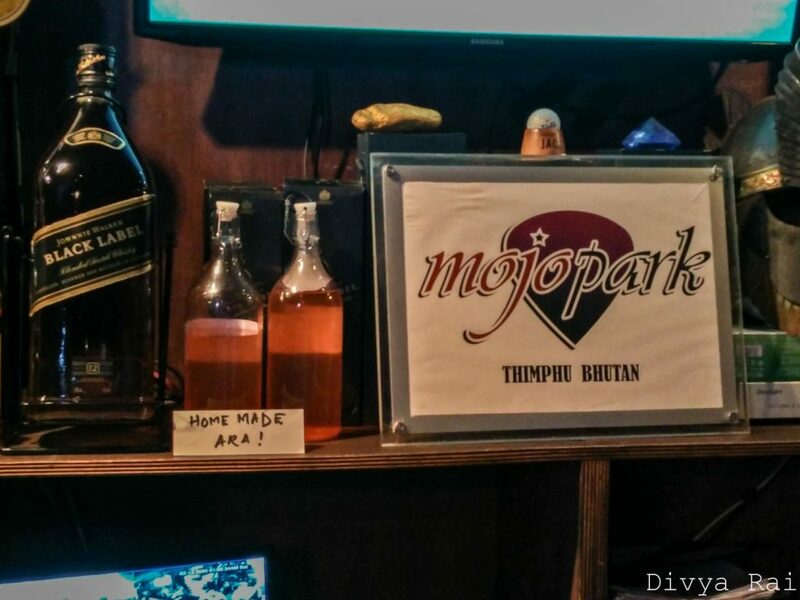 Mojo Park is one of THE places for Karaoke lovers. Since the mojo at Mojo Park comes alive in all its full glory only after the dinner-time, we decide to take a stroll on our way. As we loaf around the place, we notice that the streets have a lot of ‘real noise’- people, chatter, the clacking of high heeled sandals, laughter. Back home, we drown in honks (not allowed here in Bhutan), announcements, music blaring from radio sets and I am not missing any of it. It is a kind of time-travel. This city with single manned traffic light has a multitude of layers about it. After a bit of strolling, we decide to head towards our destination. A quick taxi ride later, we are outside Mojo Park. It is 9:00 pm, and the streets of Thimphu are changing to live up the night, as it is their last one. Once inside, I wonder what the fuss is about, as the place has a skeletal crowd and a band playing some home-grown music, apart from popular numbers. We perch ourselves on the bar stools to have an unobstructed view of the band and unabated supply of liquor. Please do not reproduce the video without permission. The most endearing thing about Thimphu is that every place has books for people to borrow while they are there, and this bar is no exception. 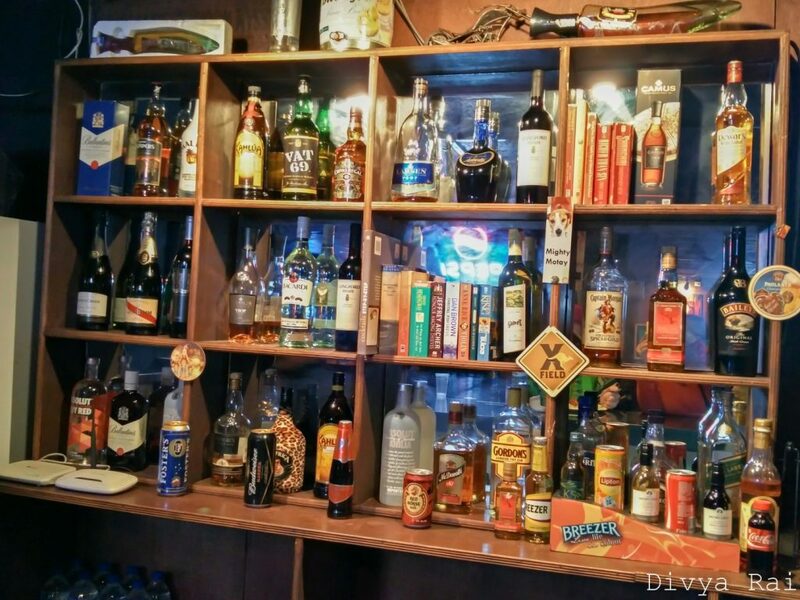 Like all things Bhutan, ‘home-made’ scores precedence over imported, hence the local liquor ‘ara’ sits in the center of the display, sharing the space with various home-made fruit wines. A man sporting mohawk with neon pink hair and punk jewelry is sitting next to me, drowning himself in ara and otherwise minding his own business. Another one who I had seen in a monk’s garb during the lunch-hour at Zombala 2, sat a few chairs away from us. Bhutan has to be the safest place I have ever travelled to! A while later, after we have discussed evry thing funky about the place and the people, I turn to face the band. The airiness of the place has traded itself for a crowd out straight from pages of a high-end fashion magazine from the Far East. I haven’t seen hairstyles this fashionable anywhere in mainland India. The day-time wear ‘kira’ for women and ‘gho’ for men are replaced by funkiest of clothes! Soon enough, there is barely any place to sit and we step out to breathe. “South Korean influence dominates the lifestyle trends here,” explains Sania, once we move to a more audibly suited area outside. Right outside Mojo Park, the taxis make a beeline, dropping off and picking up people who are walking in and out purposefully. Just as we stand undecided on our next pitstop, our hostess bumps into someone who is with her friends and invites us to go with her to a place where her mom was performing; Thimphu is really a small town that way. We decide to join that group. While everyone seems to have a roadmap for the evening, we are all about here-and-now and enjoying the spontaneity to the hilt. Sometime later, we pack ourselves in a car and head towards a less busy area in the town. A deserted road, an alley without a sign of life (or for direction) and another seemingly dingy staircase which led to a door that opened into an eclectic world of music and fashion. Here, my eyes take forever to adjust. Every time the door opens, people are streaming in thicker groups now. This is one of the few places that is open till late, it seems; a ‘hidden gem’ that everyone knows about. It is an hour past the midnight and our group decides to jam at one of the group member’s house, up in the hills. Fifteen minutes of hilly drive later, we are at a log-house in the woods. There is a mild drizzle that cannot be heard, but it can be felt if one faces the sky. Our host happens to be an ardent lover of music, as the place spells of a bachelor pad which is carefully curated with everything that an impromptu jam session calls for; including a ‘hookah’ for the listener, if there is one. The night is cool and quiet with occasional croaks and buzzes in the vicinity. The mist and the chill in the air can, at its mildest, be described as ‘romantic’. We take turns to sing some English classic numbers, and then some Hindi ones, finally rounding the night off with classic Hindi songs from Bollywood. Bhutan has a special love for Indian cinema and music, which is evident right on its surface. You hear songs from Bollywood everywhere; cabs, restaurants, and people humming them. As the night deepens, croaks of the frog grow louder than our music. As we unwillingly we call it a night and head home, I know that this is going to be etched in my heart forever, and I can’t thank Sania enough for this.